Madame Clicquot excelled at producing the finest of Champagne in her day. Grapes from as many as sixty different Crus, mainly prestigious Grands and Premiers Crus, are assembled into Yellow Label. Whilst the balance of fruit varies slightly from year to year, the Chef de Caves achieves a total consistency of taste, which makes Yellow Label so immediately recognisable, so utterly reliable, in terms of quality, visage and bouquet. 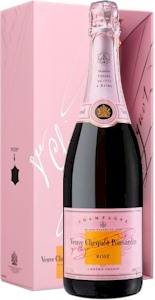 Exhibiting the most remarkable balance and exquisite freshness to taste, replete with structure, elegance and finesse. Walk down into the depths of the earth in search of the Veuve Clicquot soul, explore the secrets behind the making of a legendary wine, take inspiration from two centuries of heritage. The quality of Veuve Clicquot Yellow Label remains intact due to the proud traditions, exceptional quality of fruit and dedication of growers, an uncomperomising approach to Methode traditionelle and the estate's famous undergound chalk cellars. Veuve Clicquot is a perfect example of harmony between delicacy and power. Dominated by Pinot Noir, Yellow Label has a firm structure, rounded with a touch of Pinot Meunier. Nearly a third of Chardonnay gives it the elegance and finesse needed for perfect balance. Bright golden yellow, a foaming necklace of tiny bubbles. White fruits, citrus and vanilla nose, fruity notes and toast. The first sip delivers all the freshness of Yellow Label, a symphony of fruit follows. Here is a true member of the powerful Brut family, well structured, admirably vinous. Lingering aromas echo and re-echo, the inclusion of reserve wines ensures consistency from year to year.